The Workbench Scripting Shell is primarily used for running Python scripts, or directly typing commands in Python. However, you can also use it to access the Workbench Scripting Shell Scripting Library functions and global functions and objects. To see the available commands, type “?”. You can also cut and paste text to and from the shell window. The Snippets tab is a scratch pad for saving code snippets, which makes it easy to reuse and execute code in MySQL Workbench. 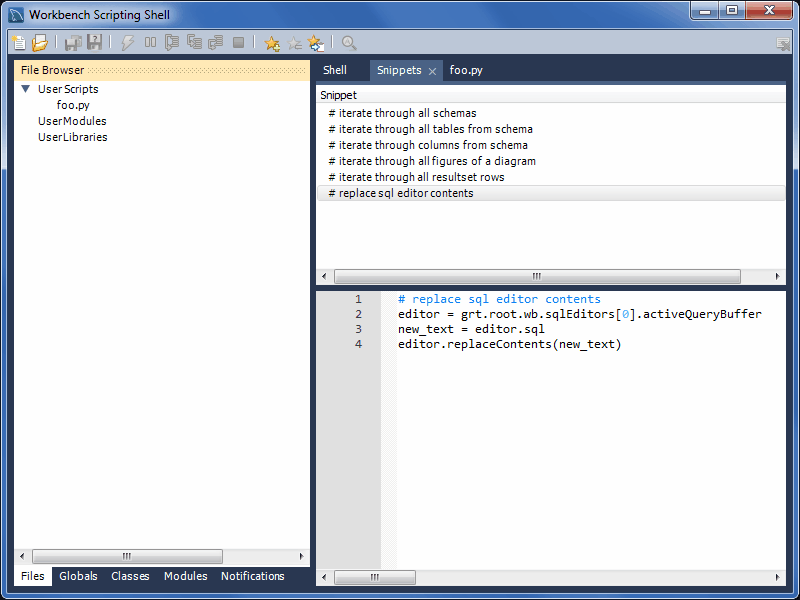 The following figure shows the Snippets tab selected. Opened script file tabs are to the right of the Snippets tab. Script tabs are labeled with the script's filename, or Unnamed for snippets without a name. You can cut-and-paste to and from the tabs, or right-click on a snippet to open a context menu with options to Execute Snippet, Send to Script Editor, or Copy To Clipboard. While individual commands can be entered into the shell, it is also possible to run a longer script, stored in an external file, using the main menu item Scripting, Run Workbench Script File. When scripts are run outside of the shell, to see the output use the main menu item View, Output. Type '? [topic]' to get help on the topic. Type 'help(module/object/function)' to get information about a module, object or function. Type 'dir(object)'                  to get a quick list of methods an object has. Within the Workbench Scripting Shell, there are five tabs on the top of the left side panel: Files, Globals, Classes, and Modules, and Notifications. An exception is thrown while attempting to use input() or read from stdin.